Does your regular window cleaning company in Hertfordshire often let you down? Would you rather be relying on an established company who do a lot more than just pop around with a squeegee? If so, you've come to the right place! Talk to Top Window Cleaners today and make a handy appointment for whatever time suits your schedule best. The team are always on time, and always turn up equipped with everything they need to give your windows a thorough cleansing. Our use of the most advanced kit means a spectacular clean for your windows - give us a call today and let us get started! The support you need whenever you need it - our phone lines stay open 24/7, and we also have online support systems. Time slots to suit every need - if you're only going to be in at a certain time, rest assured we'll have an appointment slot to cover you. Amazing monetary value - we're committed to keeping our rates low! Insurance cover and a reference-checked team as standard - we give you complete peace of mind. Professional Window Cleaning in Hertfordshire is Easy When You Know How! The teams are trained to the highest level in the use of our equipment so they can exploit it to its maximum possible effect. We use purified water in our cleaning too, which means we can rely on a natural drying process which guarantees no water-marks or streaks are left behind. 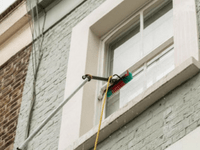 When you book professional window cleaning from us in Hertfordshire, you'll be getting a service that addresses every part of your windows, sills, seals, panes and PVC frames, and services that can be booked whenever you need them. Our wide range of appointment options means no weekend or Bank Holiday is out of bounds for the friendly and energetic team. We know you don't want to spend ages booking something as theoretically simple as window cleaning, which is why you can make your appointment with Top Window Cleaners in a matter of minutes. You'll have secured yourself work from an experienced and specially trained team who've been helping people across the local area for over ten years. The full insurance cover we provide with every single one of our services is just part of our commitment to complete reliability. 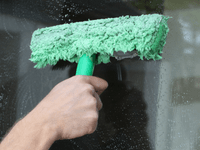 Get your domestic windows cleaned: inside, outside or both. Benefit from our commercial window cleaning at affordable rates. 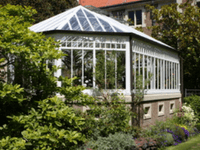 Keep the conservatory clean and maintained with our help. How to Book the Window Cleaning You Need? We operate around-the-clock customer care facility on 020 3404 9775. All you need to do is pick up the phone and dial and you'll be put in touch with one of our friendly and helpful customer contact advisers. They'll be able to offer you any additional information you might be interested in and will give you a free, no-obligation quotation so you'll know exactly how much you're going to pay before the team arrives. We're committed to making sure this quote always stays the same, so you'll get no unpleasant surprises when it's time to settle up. Contact us today at the number above, or use our chat feature or online form to reach us 24/7.